For those of you who have question marks floating around your head...a bouquet wrap is what we tie around the bouquets stems, to add that extra touch and to hide any floral tape that may be showing. Lace and Lilies always encourages our brides, to incorporate something fun, stylish or sentimental when it comes to the bouquet wrap. Not only do the Photographers love the extra details, but so do we - the importance for us to capture our clients personalities is a must! Let's start with a fave, photographed by DeFiore Photography. This deep and textured bouquet includes Purple Artichokes, an Air Plant, Flowering Kale and Thistle. To keep up with the blue, purple and greens, and especially the fun textures - we wrapped this bouquet in moss! The very opposite of our more natural wrap would be something like this killer bouquet, photographed by Lori Kennedy Photography, styled by Embellish Productions. Romance in the woods, yes please! 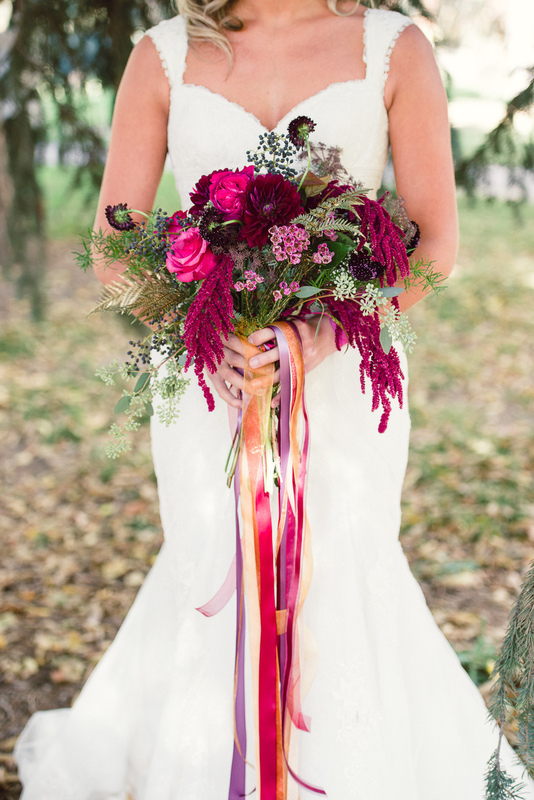 This bouquet has Roses, Dahlias and Hanging Amaranthus, complete with fun+bright ribbons! The Hanging Amaranthus and the hanging ribbons are a match made in heaven. On the flip side, some of our brides are looking for a more sentimental touch. Our beautiful Heather really wanted us to incorporate family photographs into her Pride and Prejudice inspired bouquet. Having those in your hand as you walk down the aisle, really take care of any nerves. Harper Point Photography really captured it perfectly. Other ways we have made sure to remember someone special is with these two bouquets. DeFiore Photography captured this beautiful moment. 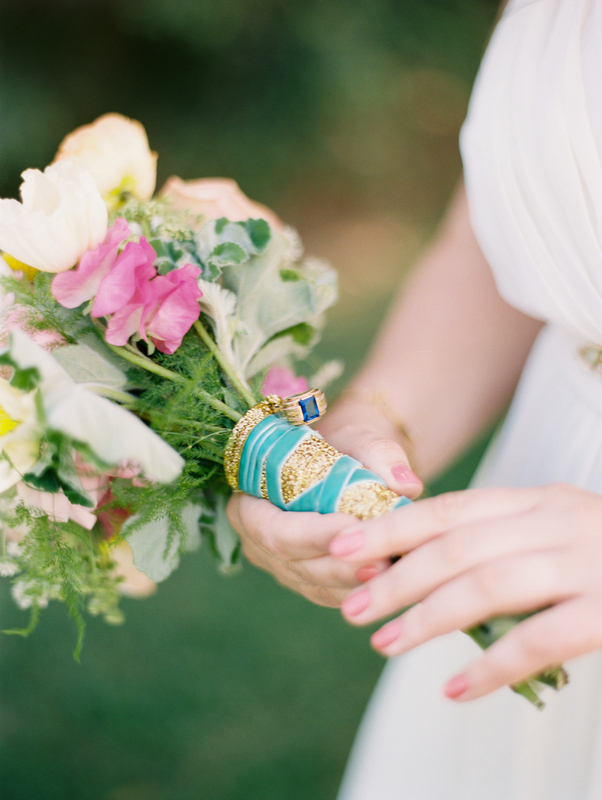 This fun and colorful bouquet included a ring from Grandma. One O.A.K. Photography made sure to snap a photo of this very special detail...a bouquet wrapped in a tie from Dad. The perfect way to know he is with you walking down that aisle. Lace and Lilies always says the bouquet wrap is a fantastic way to tie in a color or texture from your wedding that is not possible to get in the cut flower world. Who hates velvet? No one we know! Check out this stunning wrap photographed by our dear friend from Honey Bee Photography (Dress by Dora Grace). Maybe your getting married in the mountains, by a river, in the woods...twine! Maybe you want us to match your dress...lace! Or maybe your very mod wedding requires some pattern...chevron! These Garden Roses and Dahlias really popped with this twine wrap. Perfect in Aspen. Perfect by the River. Photography by Shutterchic Photography. Peonies and Ranunculus, Whites and Blush...of course, lace lace lace! Another thanks to Shutterchic Photography for the beautiful photo! Lori Kennedy Photography nailed it, mod loves chevron...and so do we!